We are a full-service golf cart shop. 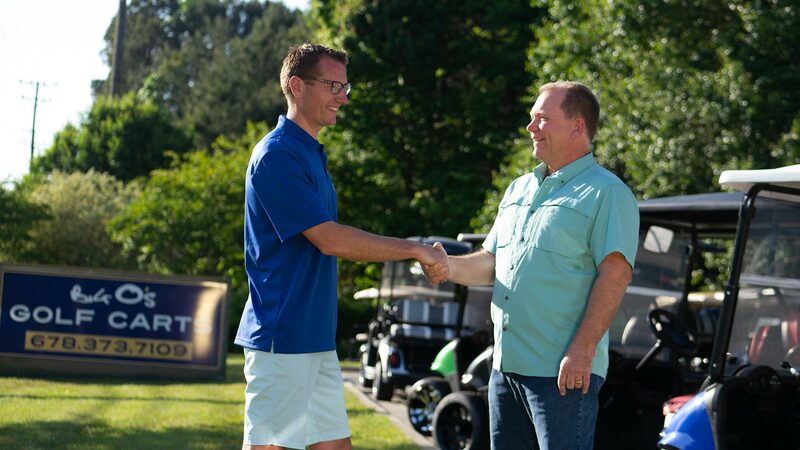 We offer just about every maintenance job needed to keep your golf cart running. Or we can get it back up and running. "We believe loyal customers are earned with each handshake." For those who prefer to Do-It-Yourself, we also sell a wide variety of golf cart parts. See our Parts Inventory or call us at 678-373-7109 with any questions or to special order an item you need. Below is a list of our most common service jobs. Goal: To determine what is causing problems on your golf cart. And to make recommendations for a specific service job. What the service includes: Like a check-up at the doctor’s office. This service includes a thorough system check to determine why the golf cart isn’t working. For example, if a customer tells us that their cart isn’t running, our technicians find out if it’s the motor, controller, batteries or charger (or something else). Then we come up with a solution to fix it. Goal: To determine why your golf cart batteries are running improperly. Diagnostic results will provide information on your current battery's life. This information helps to identify if one or more batteries is causing your golf cart to run poorly. What the service includes: Our technicians will remove the current batteries. We also clean and neutralize any spilled battery acid inside the battery compartment. Then we install a new set of batteries. Goal: To identify items that need servicing or replacing. We recommend this service once a year to prevent more expensive repairs or damages. What the service includes: Our technicians perform a 35-point inspection. This includes test drives to help identify if the golf cart is running and driving in its best condition. Goal: The goal of our Brake Service is to have a properly functioning brake system on your golf cart. What the service includes: For a traditional brake system. We check the brake shoes, drums, pedal and the operation of the brake adjustor and springs. Our technicians will clean and adjust the brake components to the recommended specifications. We will also make recommendations to replace any worn parts that are beyond repair. For EZGO RXVs with an electronic motor brake that is failing, we replace the motor brake as needed. For Yamaha Drive (G29) golf carts (made in years 2007-2013), the brakes are not serviceable. They will need replacing. Goal: To improve your driving experience and help increase your potential driving distance. A misaligned golf cart creates excessive drag on the cart and will wear down your batteries. What the service includes: Our service technicians spend a full hour correcting the “tow” of the front wheels. We also correct the tire pressure. Then they perform a series of test drives. They confirm that the golf cart is driving straight, the tires are wearing evenly, and there is no “pull” to the right or left. For lifted golf carts, alignment services need a bit more time. There is more involved, depending on the various lift kit versions. Our technicians adjust both the “tow” and the “camber” specifications. These values need to hold true to 1/8 of an inch to have a perfect alignment. Goal: To keep your golf cart running smoothly. Also helps prevent major damages to engine operation. We recommend this service at least once a year. What the service includes: We will drain the old motor oil from the golf cart. Then we fill it with new oil, and replace the fuel filter, oil filter (if equipped), air filter and spark plugs. Goal: To replace worn, damaged, cracked or faded golf cart seats with new ones. This service includes: Recovering your current golf cart seats with new factory colored seat covers. Our premium hand-stitched marine quality seat covers are also available to custom order. Service Price: On average, $370 for a 4-passenger golf cart for factory stock seat colors (black, buff, white colored). Premium seat cover prices will vary.